Sausage, onion sauce and potatoes – a Swiss tradition. The potato changed the European landscape. For many it was subsistence food – feast or famine. In the low countries, in Germany, Poland, Ukraine, in the Baltic states, in Russia, in Scandinavia, in the islands of the Atlantic fringe, in central Europe, in the Balkans … the potato became the dominant crop, changing everything. We can see today the impact of the potato on traditional food. A protein package, it symbolised working life by providing energy and well-being in every imaginable kind of form. 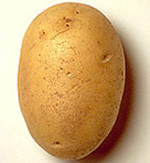 The potato was baked, boiled, cooked, fried, mashed, powdered, stewed, stuffed and sautéed. It produced national dishes in many countries, and replaced standard ingredients in traditional dishes. Now it is used as a filling for countless breads and pastries, such as štruklji, the strudels of Slovenia. It is used a thickener in soups, such as the French bouillabaisse, the Finnish lohikeitto, the Greek psarósoupa, the Monasque l’estocafic, the Irish chowder and the Scottish cullen skink. It is used as an bulking and thickening agent for stews, such as the chickpeas and meat stew of Spain, the veal and vegetable stews of the Austrian and Italian alps and the steppes of Ukraine. It is used in pastries and pies, and in omelettes and pancakes. But for all these uses, perhaps the mashed and puréed versions are the most versatile, because they become the ingredient for griddle cakes and farls, and for countless preparations. Paul Farrelly of Killeshandra was 19 when he got laid off from the building sites. It was the boat for England or boxty for Ireland. He decided to stay and now, four decades later, he has a thriving business making and selling boxty to shops in Cavan, Leitrim and Longford, and via Musgraves of Cork to various Centra and Super Value outlets around the country. He says it was one of those little accidents of life. Accident or not, to make a success of an artisan food business in the early 1980s required more than providence. His mother Nan, who ran a home bakery, provided the expertise and skill, and away they went grating and squeezing floury kerrs pinks to make a boiled boxty rooted in the tradition of west Cavan life. Boxty has been a traditional food in the north-western counties for a very long time. There is an association with halloween and the late crop of the year. Its similarity with the Swiss pan-fried grated potatoes and with the potato dumplings of the Baltic countries may be coincidental, or not. Farrelly believes credit for its longevity should go to the mother of invention and those intrepid home cooks, who always found ways to use left-over potatoes from the daily pot, and refused to throw out bad potatoes, cutting off and grating the good bits for various uses. Mixing raw and cooked potatoes is not unique to Ireland. Baking floured potato cakes on a griddle and boiling potato dumplings are traditions in numerous European countries where the potato was a subsistence crop. Farrelly is glad boxty now has a profile. In 1983 boxty was an enigma. It was known in west Cavan, Leitrim, Longford, parts of Mayo and in north Roscommon but not in east Cavan or Monaghan or the rest of the country. But Farrelly and Nan persevered, buying custom made equipment from a factory in Broughshane in county Antrim, and very gradually Drummully Boxty was established. By refining the traditional method and by using good rooster potatoes from county Meath, Farrelly and his mother created a business that now employs three people, keeping them all at home, away from the ignominy of migration, rooted in their place. Traditionally boxty was made on the griddle, with the starch from raw potatoes, mash from boiled potatoes and salt. Gradually the method changed to boxty boiled in a pot, boxty fried on a griddle or in a pan, and boxty baked in the oven. Flour was added to pan boxty, then milk and bicarbonate of soda to form a batter that could be cooked like a pancake. Flour was also added to baked boxty along with butter or lard or bacon fat, seasoned, and shaped into farls. Drummully Boxty is made with potatoes and salt, and boiled. It is cut and fried, baked or grilled. From Cheese, Chowder and Comfort Food: Ireland’s Food Renaissance. Brændende Kærlighed DENMARK Burning Love! In Denmark it is the tradition to serve mashed potatoes garnished with bacon and onion and the specialities of the region where you originate. These accessories can come from a selection of cheeses, pickles and sausages as well as beetroot, carrot and cucumber, and berries, herbs and fruits. With the industrialisation of the country in the 19th century, migrating workers brought their traditional dishes to the city. This dish, euphemistically known as burning love because of the piping hot potato mash, epitomised the food of the provinces, each putting their own version into the mix. Preheat oven to 200°C. Place the beetroot on a greased baking tray with the thyme, bake for 15 minutes. Fry bacon in a pan without fat or oil until it is crispy, set aside. Sauté onions in the bacon fat in the pan until golden. Return bacon to the pan and heat through. While the potatoes are still hot, mash with the cream and milk, season, and keep warm over a low heat. Melt butter. Spoon into the centre of a deep plate, make a hollow in the middle, add bacon and onions followed by the butter, then the beetroot. Surround the mound with chives, parsley and personal accessories. Among the Slavic cuisines, traditional Ukrainian food is considered one of the most diverse, and its peculiarities are the consequence of being restricted to baking in a hot oven and cooking on hot plates. Ukraine borrowed much of its food culture from neighbouring countries but the arrival of the potato in the 19th century impacted heavily on the use of traditional cereal, fish, meat and vegetable products. The predominance of pork and veal, garlic and onion, berries and fruits, grains and herbs, leaf and root vegetables were the result of an agrarian lifestyle. A hallmark of these ingredients is borsch, totally representative of the diversity of native dishes. Borsch can be green, red and cold. In the old days borsch contained beetroot and bread, but nowadays this version is rare. A technically sophisticated dish, modern borsch uses several culinary techniques and a large number of ingredients. This is the recipe for red borsch by Andrey Kokarev, head chef at Estadio in Kharkiv. Simmer bones for two hours, add veal and simmer for 90 minutes, strain liquid and retain the meat. Sprinkle some vinegar on the beets, fry in oil for 15 minutes, then add a small amount of broth and stew for 20 minutes. In a separate frying pan sauté carrot, parsley root and shallot in butter for a few minutes, then add tomatoes, sugar and vinegar. Return to the large cooking pot. Cook potatoes in the meat broth for 15 minutes, then the cabbage for 10 minutes, season with salt. Add stewed beets for 10 minutes, then the fried vegetables.Simmer everything for 10 minutes. Meanwhile cut veal into bite-sized pieces, add to the pot with the spices. Remove pot from heat, add garlic, herbs and salo, cover and allow at least 20 minutes of infusion. Serve in large bowls with a tablespoon of sour cream for each diner. From Traditional Tastes of Europe. Johann Jakob Strub brought the potato to Switzerland. A native of the canton Glarus, he was a lieutenant in the English army and according to legend returned home with a bag of seed potatoes from Ireland. Potatoes were cultivated in Glarus in 1697.They spread to the neighbouring cantons and by the middle of the 19th century prötlete herdöpfel, fried potatoes, replaced barley porridge as the preferred breakfast among farming families around the growing city of Zurich. The recipe travelled south-west into the Bernese countryside and over the mountains into the Roman canton of the Valais, where it was called pommes de terre roties. It became the morning meal among the French-speaking farmers, was shortened to roties – rösti in Swiss-German. By the mid-20th century variations of the original recipe began to appear. 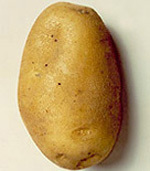 The Roman west preferred boiled potatoes, the Germanic east used raw. Mix onions and potatoes, and sauté in a frying pan over a medium heat for ten minutes. Place a plate on top of the frying pan, invert onto the plate. Oil pan and slide rösti back. Cook for 20 minutes. The rösti story is told in Cooked, Cured and Curdled: The modern story of traditional food in Europe and in Blue Window | Food Travels in the Alps. Varieties of potatoes are discussed in Cooked, Cured and Curdled: The modern story of traditional food in Europe. Across from the railway station in Lausanne is a rising cobbled street. It leads to a busy road in the heart of the lakeside city. Tucked in beside St Francois church is the august establishment known as Café Romand. Under the auspices of Madame Christiane Péclat and her chef cuisinier Thierry Lagegre, it is rustic charm and serves some of the best traditional food in Switzerland. If you are lucky you’ll get a two-person table by the wide window looking out at those looking in, wondering what you are going to eat. If rösti is on your plate you might get a jealous look. Lagegre makes it with parboiled semi-waxy potatoes, in the fashion of the Bernese. When UNESCO recognised the Bernese for their craftiness with this Swiss treat they knew what they were doing. So there is an irony about a restaurant in Roman Switzerland perfecting a dish with a legendary association to the Germanic cantons of Switzerland. Grate potatoes and mix with salt. Heat a large frying pan, add a third of the butter and oil, making sure to cover all the surface and up to the rim, turn heat to low. Add bacon and potato, fry, pressing down with a spatula to form a cake. After ten minutes add another third of the butter and oil all round the edge of the rösti cake. When the edges start to harden and crisp, shake the pan to make sure the potato mix has not stuck to the base. Cover with a plate and fry for another ten minutes until the underside has formed a golden crust. Turn the rösti over by inverting the pan and plate, leaving it on the plate, and sliding it back into the pan. Add the remaining third of the butter-oil around the edges. Leave to fry for ten minutes. Finally pour the milk over the rösti, cover and cook for ten minutes. The milk will evaporate. Lard should be used but low fat butter mixed with vegetable oil is a viable option. Crafty cooks use goose fat laced with oil because it brings up the golden colour. Potatoes were cultivated in Glarus in 1697. They spread to the neighbouring cantons and by the middle of the 19th century prötlete herdöpfel, fried potatoes, replaced barley porridge as the preferred breakfast among farming families around the growing city of Zurich. The recipe travelled south-west into the Bernese countryside and over the mountains into the Roman canton of the Valais, where it was called pommes de terre roties. It became the morning meal among the French-speaking farmers, was shortened to roties – rösti in Swiss-German. By the mid-20th century variations of the original recipe began to appear. 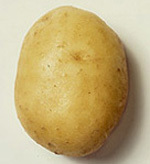 The Roman west preferred boiled potatoes, the Germanic east used raw. Mix onions and potatoes, and sauté in a frying pan over a medium heat for ten minutes. Place a plate on top of the frying pan, invert onto the plate. Oil pan and slide rösti back. Cook for 20 minutes. The divide is longer between east and west, boiled and raw, lard and oil, it is between good rösti and bad rösti. The secret to the success of rösti lies with the choice of potato, and how it is prepared. Starch content is crucial. It should be low to medium. Generally mealy potatoes do not make good rösti and generally waxy potatoes are too firm, but these rules do not always apply. Swiss Agriculture recommend the Lady Christa, Ostara, Sirtema, Urgenta and Victoria varieties, which are all firm potatoes in the middle range. The perfect rösti should be compact and crisp, and not greasy. To achieve this, the potatoes – cooked or raw – must grate evenly and hold their cut shape. 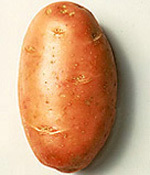 Cooked potatoes are cooled in a fast-freezer, raw potatoes are cooled in a water bath. Then they are grated in a food processor for less than a minute. Home chefs face challenges here. Leaving them overnight in a cold place is how they did it in past days, and today the fridge will achieve the same aim – cool the potato for grating. Whatever the choice, the grated potatoes must go into the pan or skillet immediately. Butter or lard is still the preferred frying medium but the use of oil, sunflower in particular, is becoming popular. The next secret is controlling the heat and gas is preferred to electric, to prevent the rösti cake from burning. And the final secret is experimentation – like all simple cooking! Old style rösti. Recipe in Ice Travel and Snow Food: Culinary Adventures in Western Switzerland. The idea of making rösti with slow-cooked roast potatoes sounds like a new idea. It’s not. Making rösti with leftover roast potatoes was always a tradition, it just never caught on in the cafes, diners and restaurants until now. Recipe in Ice Travel and Snow Food: Culinary Adventures in Western Switzerland.